The collar is not for tie out and all buckles are made from eco-friendly plastic. The metal D ring is black coated to add durability. Made of quality neoprene webbing and polyester ribbon sewn on top. Good looks are not everything – what is on the inside counts too. With this practical methodology, Blueberry Pet strives to provide the best quality designer dog collar to our customers. This MADE WELL dog collar collection features luxurious neoprene webbing with polyester ribbon sewn on top and offers a modern spin on classic dog collar style. 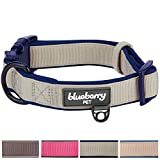 You will find the best-selling dog collar structure that Blueberry Pet launched in the past for all loved pups – classic black D-ring, durable plastic buckles, and the accessory loop. The modern spin belongs to its unique color selection, which was handpicked by our in-house designers. This neoprene dog collar is available in 4 color combinations: beaver brown with taupe gray webbing, light khaki with oxford blue webbing, beige with glaucous blue webbing, and muted red-violet with gray webbing. You will not be disappointed as this dog collar brings ultimate comfort to your four-legged friends and they would wear all year round. Versatile and easy to match with any dog accessories, this dog collar is the editor’s favorite pick for this special season! If you are thinking about keeping rabbits or small animals the rabbit hutch JENNY is the right choice for you. 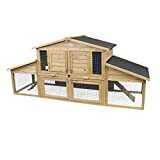 The extensive areas ensure that the hutch made of solid fir wood becomes a real palace for your animals. The animal house has a spacious, closed interior area and a big, roofed exterior area which is enclosed with a wire fence. Two ramps connect these areas and give the animal the possibility to move within its home just as it likes. The closed area offers a retreat against any weather condition whereas the outdoor area allows the animals to breathe fresh air while you can perfectly observe them. Thanks to mortise joints and solid metal hinges, the hutch has a solid construction. Additionally, wooden beams allow an easy installation. The house and the outdoor enclosure each have two doors which make possible to have fast access to the animals. Thanks to the mesh of wire on the front side of the closed area, you can check from afar if the animals need to be fed. Two extendable drawers underneath the house facilitate the cleaning. This drawers have metal tubs which can be emptied easily and fast. The roofs of the areas are covered with a bituminous felt and offer additional protection against cold and moisture. Therefore, the animal house is the perfect home for your animal both in winter and summer. The small mesh size of the wire fence prevents the animal’s entaglement. The rabbit hutch has an environmentally friendly paint and the used wood comes from ecologically sustainable forestry.